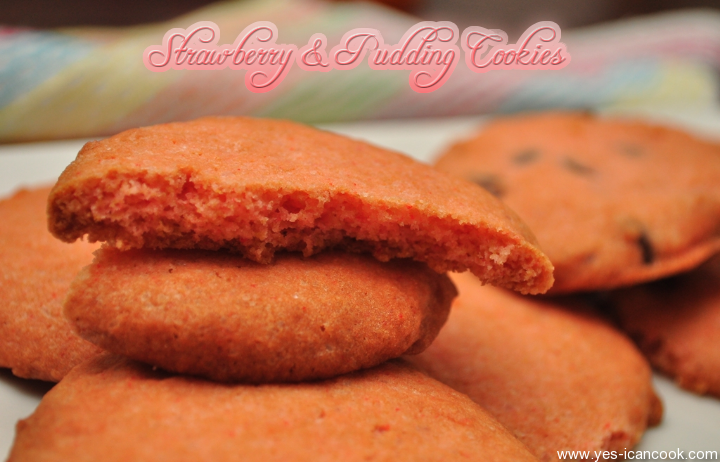 These have to be the best cookies I have made and they are so easy too. Every crunchy bite bursts with flavour and you will thank yourself for baking them. I will definitely make them again and will also try with different jello flavors. Jello? Yes you read that read. The strawberry flavor and the color in these cookies are from strawberry jello mix. 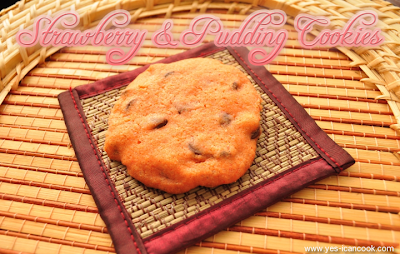 I come across several cookie recipes and pictures. Even though I love them I don't really make them. This particular recipe and the picture, not to forget the name attracted my attention. The recipe for these cookies call for instant pudding mix which I did not have handy but I looked online and found a substitute which is easy to mix at home. I have included how to make it in notes. The original recipe called for white chocolate chips but I used semi sweet dark chocolate chips. I also made half of them plain for my husband who doesn't prefer chocolate. Make these cookies and you sure will love them. I made a smaller batch from the original recipe so please do not mind the way I have mentioned quantity of ingredients. 2. In a mixing bowl add all purpose flour, pudding mix, salt and baking soda. Mix well to combine. Keep aside. 3. In another mixing bowl or in stand mixer add butter, jello powder and sugar. Mix well to combine and to cream it. I used hand mixer. 4. Add egg and vanilla extract and mix well. Add additional vanilla extract if making your own pudding mix without vanilla beans. 5. Slowly add the flour mixture to the butter mixture in small quantities and mix well before each addition. 6. Add the chocolate chips and mix to combine. 7. Drop spoonfuls of this mixture on a greased baking tray or a baking tray lined with parchment paper. flat forming the cookie while baking. 9. Bake for 9-12 minutes or till done. Mine were done in 9 minutes but I left them in till 11 minutes just to be sure and they lost the pretty pink color and took over a brown shade :( however they taste great. 12. Allow to cool and store in air tight container. They are soft when out of oven but will turn hard and crunchy as they cool down. 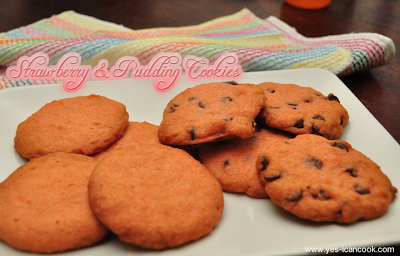 Enjoy strawberry and pudding cookies. Here is a substitute I found for instant pudding mix. 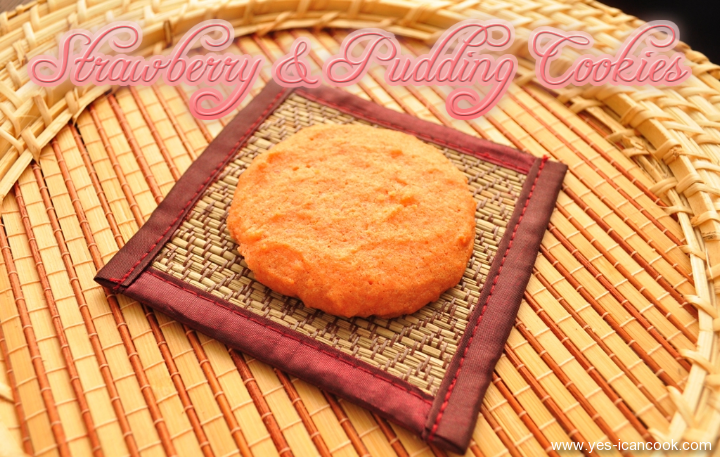 The original recipe was equivalent to 5 pudding mix quantity and I cut it down to 1. 1. In a mixing bowl add all the ingredients except vanilla extract and mix well to combine. Store and use wherever vanilla pudding mix is called for and remember to add some vanilla essence. 2. To make a basic instant pudding using this mix, In a saucepan add 1 cup of milk with 1/4 cup of the pudding mix. Add 1/4 teaspoon of vanilla extract if not using vanilla beans. Cook on high heat whisking continuously. Reduce the flame to low when it comes to a boil and continue whisking till the mixture turns thick like a pudding and starts to coat the back of your spoon. This takes about 2-4 minutes. Switch off flame and serve only after letting it sit for 5 minutes. I seldom bake and am always for the easy and simple ones. This is so good especially the color and berry jello o and chocs. Definitely a try when we have guest over. Let me know how you liked them if and when you make them Navaneetham. 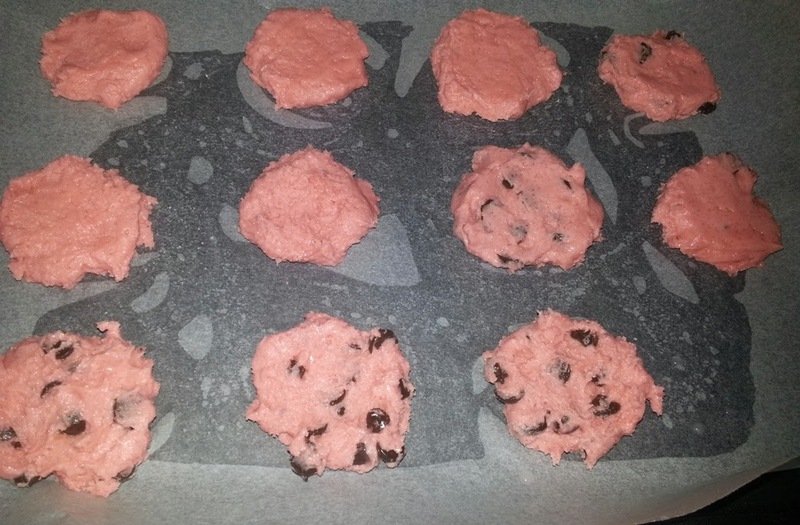 I would have achieved a beautiful pink had I taken them out of oven a minute or two in advance. Definitely Subha. Give it a try and let me know how you liked them if you do. Those are really sinful cookies. I can't see your GFC follow button ? I just added it, take a look. Thanks Resna. Let me know how you liked them. Very innovative and interesting cookies. Thanks Chandrani. They sure are as tasty as interesting as the recipe is. Thanks Nilu. I will head over to your blog. Thanks for the invite. love the color...looks fabulous and very tempting...must try!!!! Thanks Pooja. Let me know how you liked them if you do try. They sure were Bay Leaf. I wonder if these would work with veggie jelly. It tends to be softer. I am not quite sure Jacqueline. Why don't yo give it a try if possible and interested and you can let us know your valuable feedback. Thanks for stopping by and posting. 1st time here. lovely cookies dear. Happy to follow u! I welcome you to my page Madhavi. Thanks a lot. Its my pleasure to have you over.